There is reason to be optimistic about DC United’s stadium situation. While almost every interview that United gives about the stadium seems to say very little, there are some tidbits and some things that can be gleaned from reading between the lines. 1. Chang and United are really committed to staying in the DC area. You wouldn’t go out and get local investors if you wanted to leave, would you? 2. A stadium plan has to be in the works. Why if you were a local investor would you invest money in a money-losing club if there is no prospect for a stadium – that financially makes no sense. Investors would only invest if there was something to invest in, and that means there are likely some prospective deals, but each of these would require United to bring more money to the table. In other words, Fenty says you can build a stadium at Poplar, but the city will at most put up X, meaning you will have to get Y. So the team is out trying to get Y. After the Prince George’s stadium deal fell apart last year so did the DC United ownership group. Will Chang, personally the most committed owner, bought out the rest of the ownership group including principal owner Victor MacFarlane. MacFarlane, an incredibly wealthy and successful real estate developer bought the team not because of an interest in soccer, but because he saw an opportunity to get in on a major real estate deal that had already been agreed to by Mayor Williams and DC United over Poplar Point. Needless to say Poplar Point fell apart with Adrian Fenty’s election. The team then turned to PG County just east of the city. 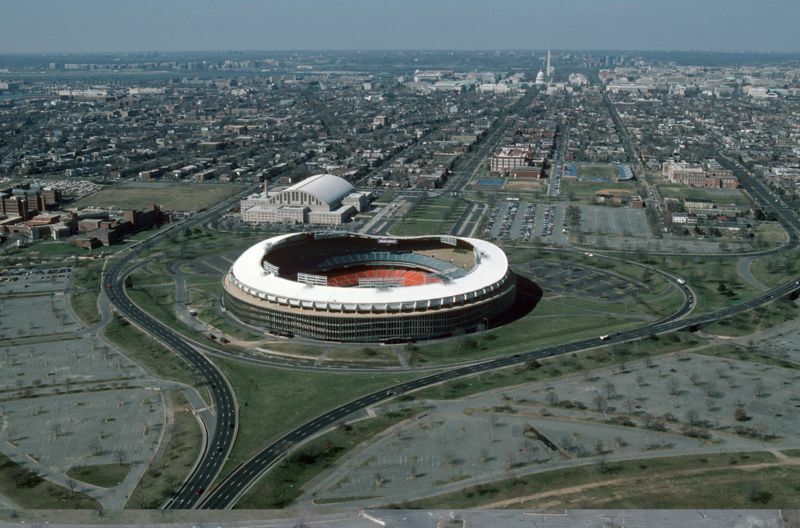 PG county had been eager to attract development, especially sports teams (ala Redskins). So about this time last year United held a press conference with PG Country elected officials announcing plans for a stadium near the Redskins Fed-Ex field. But the political officials badly misjudged the public mood and poorly explained the deal. The notion that tax payer money would go to a sports stadium (which was not entirely true) in the midst of a recession, drew public outrage, which led to county leaders and Maryland politicians to walk away from the deal, essentially leaving United totally out to dry. MacFarlane as a result threw up his hands and wanted to either move the team or wanted out as owner. At this point the commisioner Don Garber and the team started uttering threats of leaving town. At this point, Will Chang a part owner stepped up and bought out the other owners. Upon taking over the team Chang indicated that while getting a stadium was urgent, he could deal with playing at RFK in the short term. He also was just interested in a stadium, not leveraging it into some big land deal as MacFarlane was. So my assesment of the situation is this. Chang loves the team. I met him briefly at the public unveiling of new coach Curt Onalfo at a bar in downtown DC. He didn’t need to be there. But he wanted to be. While he is not from DC, he seems to really have taken to the city and the team. In essence, while MacFarlane had the money, but not the will, Chang, has the will but not the money. So one of the biggest obstacles the past year for a stadium, is no longer the need for a massive amount of land, but is building an ownership group with deep pockets. But this is an obstacle. What Are The Team’s Options? With the economic climate as it is, I think United’s chances of getting any locale to contribute significant funds to a stadium is very limited. Virginia is in a financial mess and counties that United has flirted with like Loudoun in the outer suburbs are not only a nightmare to get to, but have been hit hardest by the crisis. The District also has its financial troubles and is having to trim its budget. PG County will now never happen. And finally Montgomery county, while with the economic clout, is similarly experiencing financial woes. In other words, there is no region in the area that will simply give United a stadium. So that leaves the option of Baltimore. There are a number of reasons to be skeptical. First, Baltimore has a team that will now be in the second division. Second, United would be leaving a major market for a smaller (even if it was connected). This would be bad for the league and bad for the long term value of United. Teams rarely leave a big market for a smaller one. I think what’s really happening here, is that United, while viewing Baltimore as a fall back option, is trying to play the DC-area off Baltimore. Despite the difficulty in dealing with the District and the city council there are some reasons to be hopeful about the District as a possible venue. First, this is an election year. While Fenty may run unopposed, he is starting to get some blow back particular among the black community. While this may not seem to have anything to do with the team, this has relevance to United, because Fenty bucked Marion Barry city councilman of Ward 8 (the poorest ward in DC and where Poplar Point is located) who strongly backed the United Poplar Point plan. Fenty’s move looked like a winner at the time because he got a better developer and a better plan for Poplar, but the massive redevelopment project fell through when the developer pulled out due to the economic crisis. So Fenty has been hammered by Barry and is struggling in Ward 8. Following through on a stadium in Ward 8 could be politically appealing. While there has been no indication that a stadium is back on the table for Poplar – as a new planning stage has just started – it would seem to make sense for all parties to want to get a stadium there. However, there is a but. And the but is that Fenty and DC politically can’t have this be seen as a giveaway to the team. So for any deal to get done in the District, or anywhere else in the reigion, United is going to have to put up a lot of money to make this happen. The era of free stadiums may not be entirely over, but it is certainly much much more difficult for teams to get municipalities to simply pick up the tab. Second, the fact that Chang does not need lots of land, that he wants to be in DC, and has suggested in the past that he would be okay with a more basic no frills stadium, indicates that this does not have to be a massive economic deal. Numerous locations within the district could be suitable for a no-frills stadium that would also reduce the amount of investment needed to construct such a stadium. In other words, a number of the previous obstacles to getting a deal have been removed. Third, there are signs that United is making appeals to the District. For instance, United has made the point that one of the decisions behind USSF’s decision on World Cup venues is whether it will help sustain the domestic game. In other words, Kevin Payne is arguing that World Cup city selection between Washington and Baltimore will be decided by which city gets United a stadium. I think this is a pretty thin argument but it at the very least demonstrates that United is trying to offer the District some carrots for a stadium. In sum, I think DC fans should okay right now. They have a committed owner who is interested in the long term success and health of the club and is willing to take a short term financial hit because of it. He is also committed to staying in the area. Talks are taking place with a number of areas and United is seeking new investors, which has to mean that a new stadium would be part of the pitch to these investors. Finally, Payne was ultra-cautious with Goff, but still said there would be clarity in a year. That’s not half bad and provides some reason for optimism.